Analysis: Bonding conditions are not suitable, such as bonding temperature is too high, too low, low pressure, short time and other reasons. 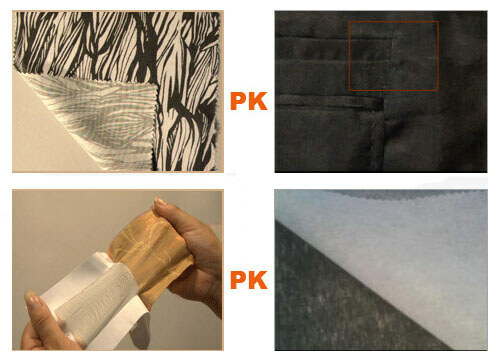 Less adhesive or quality problem of fusible interfacing. Solution: Properly adjust the bonding conditions (temperature, time, pressure) or change other fusible interlining. Analysis: Because there is shrinkage difference when the fabric and interlining thermal bonded. If the adhesive is not solidified, the size difference caused by thermal shrinkage and lead to bubble. If the thermal shrinkage of fabric is larger than that of lining cloth, the lining cloth bulges, and vice versa. Solution: Choose the interlining cloth with the thermal shrinkage matching the fabric. If the fabric shrinks too much, you can use the same bonding conditions in the fusing machine. Heat shrinks the fabric firstly, adjust the bonding temperature and time properly, so that the thermal shrinkage of the fabric is kept to the smallest extent possible. Analysis: The particle size of hot melt adhesive powder of the lining cloth is not consistent with the processing technology during the coating process and causes the glue penetration. Solution: Choose suitable interlining according to the thickness of fabric. General fabrics from thick to thin, selected mesh number from thin to dense interlining cloth.